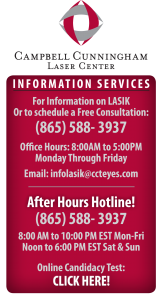 Get Answers To Questions About LASIK Vision Correction—After Normal Business Hours! We know that summer is especially busy for many people. So to better accommodate you, we’ve established a special after-hours hotline staffed with people who can answer questions about LASIK vision correction. Operators can help you get information about the LASIK procedure, plus help you schedule a free consultation with the Campbell Cunningham Laser Center at a time convenient for you. Hotline hours are Mondays through Fridays from 8:00 am to 10:00 pm Eastern Time, and Saturday and Sunday from Noon to 6:00 pm Eastern time. The hotline is also a great way to supplement any online research on LASIK vision correction you might be doing, with professional expertise that makes sure you get the right information. To use the hotline, simply call our regular number: (865) 588-EYES (3937).